Brexit - Any thoughts UK or EU friends? It's official: Britain is leaving the EU. Any thoughts on the matter? They really screwed themselves. But hey, xenophobia tends to do that. 1) As a (now) former EU citizen (British dual citizenship, my dad was born in Luton), I am very, very pissed that I no longer have the right to live and travel in the EU, and I had no say in the matter. I'm outraged, really. I'm generally in favor of decentralization in order to provide more choice and to avoid the existence of political superpowers, so I'm not crying a river over this. That said, I'm also in favor of freedom of movement and lax borders, because it makes being able to choose which country you live in more feasible. It's also funny to see people who are just now realizing the problem with democracy. I've seen a couple people suggest that the solution is to only allow young people to vote, but that's just discriminatory and terrible. The real solution is, again, decentralization and choice. 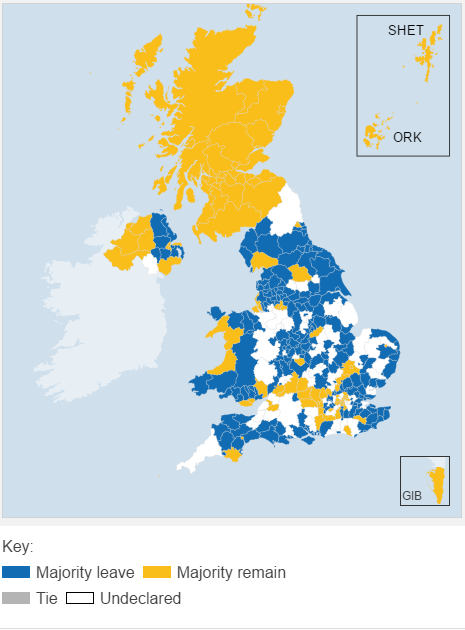 I've seen a sort of decentralization suggested where the areas who voted remain would be split from the areas who voted stay, but that was probably just a joke.